Don?t balk at the word kale. The secret is baby kale leaves. They are tender and work well as the base of this salad. Salads are perfect for gluten-free diners on vacation. They are an easy meal when I?m eating out in an unfamiliar place. I ask for oil and vinegar on the side. At home, although my kids all eat salad, I?ve been trying to get them to eat kale for a while now to no avail. Kids don?t care about superfoods. They just want food that tastes good. You don?t have to tell them the ?lettuce? is really kale. 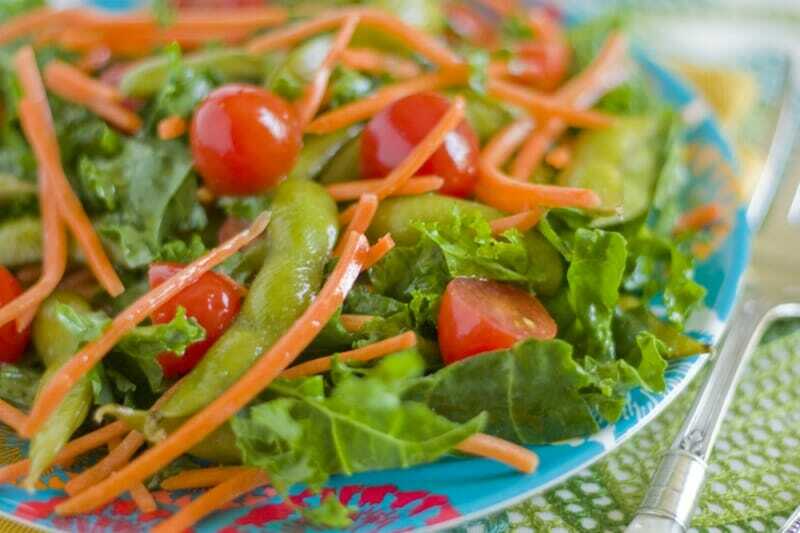 Combine kale, carrots, edamame, cherry tomatoes and grilled chicken in large bowl and toss together gently. To make the dressing in a glass bowl, whisk together olive oil, lemon juice, garlic powder and salt. Drizzle dressing on top of salad and toss before serving.